This year, I thought I would try to make taiglach for the first time with Raizel. The word “taiglach” is Yiddish for “little pieces of dough” which are cooked in honey. Growing up, this was a very special holiday treat that we only enjoyed on Sukkot. Taiglach are traditionally served on holidays which emphasize sweetness and joy. Some people have the custom of eating them on Purim as well. I have very fond memories of eating taiglach in the sukkah as a child. I looked forward to them every year! Raizel was very excited to try this. I was excited that she was excited. Aside from Mommy time, making this also gave Raizel an opportunity to practice using her hands and develop her fine finger dexterity. Since my oven is still not working well, there was the added incentive that taiglach can be made on top of the stove. No oven required! So, it’s a win-win! Dolly from koolkosherkitchen.wordpress.com graciously made this recipe at my request. Unfortunately, I didn’t see it until after I made the version below. Happily, our versions are slightly different. Experiment with which one you like best. According to Dolly, her family made them with raisins and almonds and piled the taiglach up in a mound. However, growing up, our taiglach were made in a single layer and made without raisins or nuts. Instead, they were sprinkled with coconut. 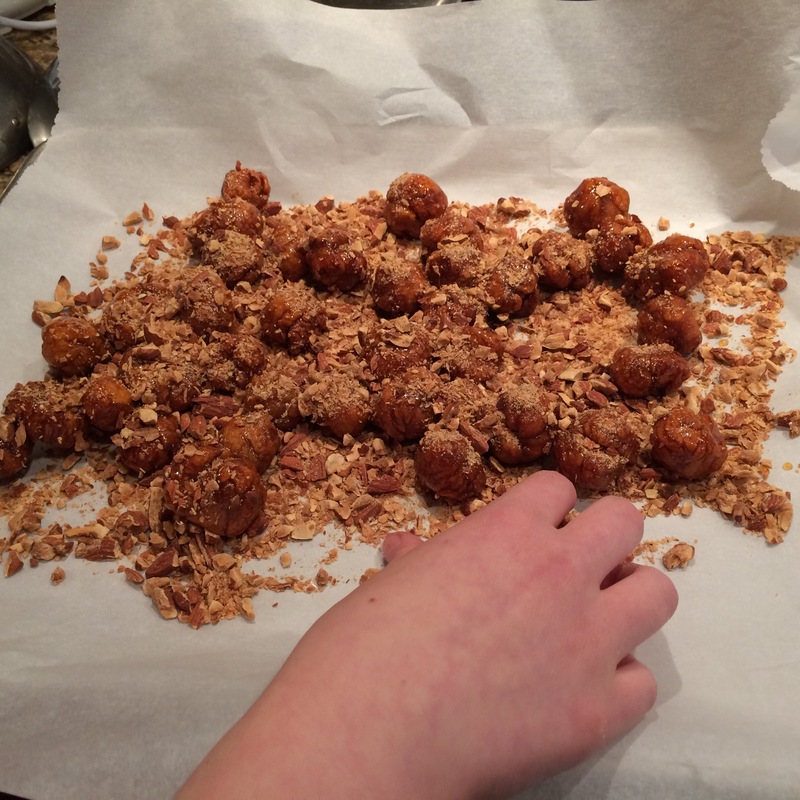 Please check out her blog and wonderful explanation on this delicious treat. 2 tablespoons boiling water. This is critical, because otherwise the syrup will become too stiff and hard when it cools. Optional: ½ cup coarsely raisins or minced candied fruit. Optional: shredded coconut to sprinkle as desired. To make the dough: Combine the eggs, vanilla (if using) and oil together until smooth. Add 1 cup of flour, baking powder and the salt. Gradually stir in enough flour to make a soft, workable dough. If the dough is too dry, add a small amount of cold water. Place on a lightly floured surface and knead until smooth, about 2-3 minutes. The dough should be soft, and not sticky. Traditionally, the dough is divided into 4 and rolled into a rope until it is approximately .5 inches thick. Then the dough is cut into .5 inch pieces. Some people then tie them into loose knots and tuck the ends underneath. This dough, however, is very flexible. It can be cut into squares, or rolled into balls instead of twists. The pieces can even be baked or fried first for added crunch. 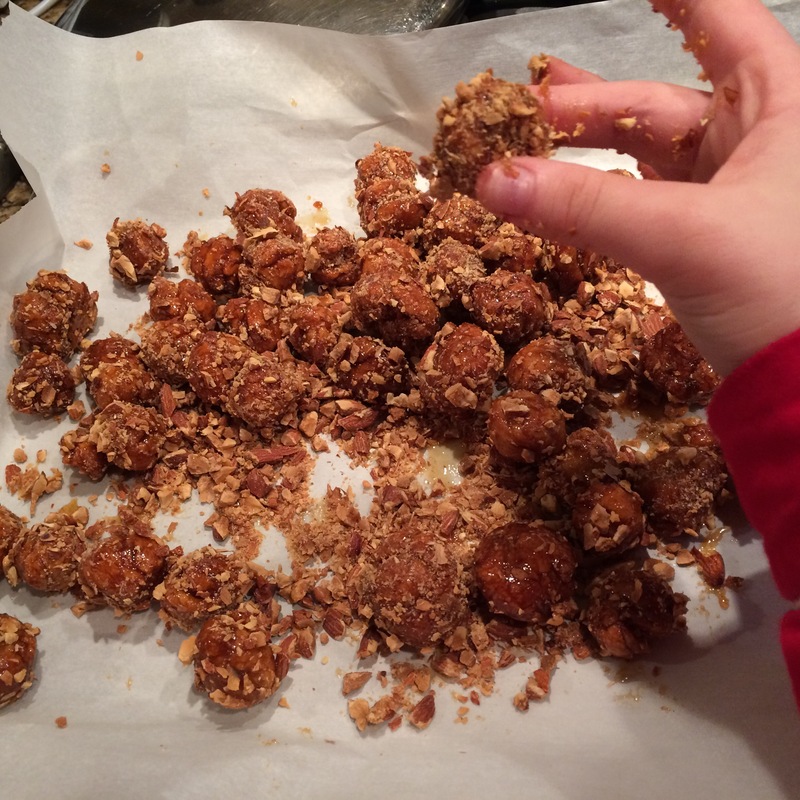 Since I am time challenged, I cut the dough into 36-40 pieces and then rolled them into balls. Some people like to add a few raisins inside the balls. Feel free to experiment. 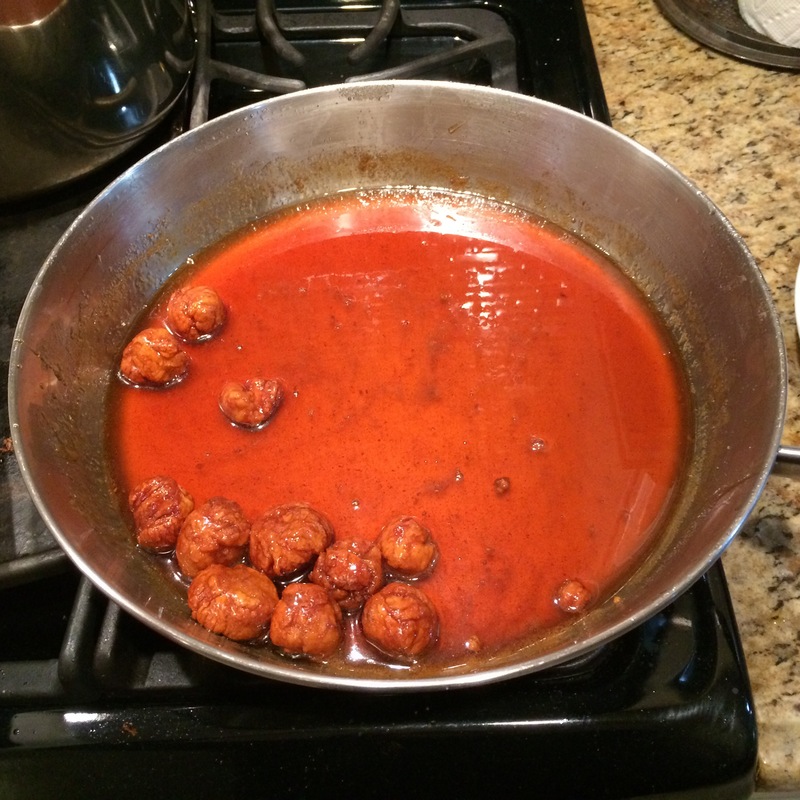 Syrup: Combine honey, sugar and spices in a large sauce pan and bring to a boil. To assemble: Drop the pieces of dough into the syrup one at a time. Reduce the heat to low, and let them rise for 2 minutes. Cover and simmer for 15-30 minutes, without stirring. Then, stir the dough pieces occasionally so that all the pieces will cook evenly. Simmer (up to 45 minutes) until golden brown and the dough sounds hollow when lightly tapped. Add boiling water and remove from heat. Spoon onto lined cookie sheet or pan in a single layer to cool. If desired, roll in chopped nuts or sprinkle with coconut. Pour some of the honey syrup over the taiglach if you would like them to stick together. Save the rest of the sauce for a recipe that calls for honey. I am planning on using it to make chicken. When cool, place in a sealed container. Do not refrigerate. The taiglach can remain at room temperature for several weeks, but hopefully they will be gone before then. A few left in the saucepan. Raizel rolling them in nuts. Raizel and Yaffa LOVED them! That was the first time that she validated my beliefs that prayer and love are critical to successful cooking! It was “Yiddishe nachas!” For those who may not know, Yiddishe nachas is a term which refers to the inner warmth and pride one feels when one observes the transmission from one generation to the next of one’s spiritual values and traditions. True bliss on so many levels. mmm. . . Just reading your description of taiglach makes me hungry for it. And, your description of Raizel’s statement about them was so precious and heartwarming. Oh, these look so good! Thank you! A childhood favorite. These sounds so good, and what a name, Taiglach. I love how that sounds sounds a bit rough, yet tender at the same time. Not at all surprising to me that your kids loved those little treats, and as a mum I can relate to the term Yiddishe nachas as well, if perhaps not in the same spiritual connotation. What a beautiful post full of love and pride and warmth. Thank you! Yiddish is a highly expressive language full of words that sounds like what they mean. I guess “Yiddishe nachas” refers to those special warm moments as a parent of inner pride when one’s children emulate one’s truest and deepest values. I am not sure what the precise English words would be to describe that? Not being a native speaker, I really am not the perfect person to answer that. But I will not your expression of Yiddishe nachas, for the feeling its meant to describe is so familiar to me (and to any parent). The closest I can come up with is parental gratification. What do you think? That sounds pretty good to me. Just googled it and also found proud parental pleasure/joy. Anyway you call it, a wonderful feeling! It is so wonderful, when you can see, that your kids did listen, even while you thought, they did not. Teenagers are teenagers and it is the time, when they need to free and find themselves, which is a challenge for both kids and parents. Thank you! Teenagers are particularly challenging. One minute she loves me, the next minute, not. It is very confusing! Then, she surprises me all over again. Go figure! I get so much joy reading about the relationship you two share. This adds so much quality to both of your lives. My mother did not enjoy cooking. Our Taiglach came from the bakery and was piled up as described in the post you added as a link. Coming from a family with obesity, I enjoyed all the bakery goods that ALWAYS was found in my house. I’m very thankful for learning (young) the dangers of this lifestyle and AVOIDING this outcome for myself. This plays a big role in explaining why I attempt to help people circumvent this dangerous path in life. It is so funny — one would think that someone who likes to eat would like to cook, but, I guess that is not necessarily so. Food can be a real issue. The trick is balance. I am astounded that you learned so young about the dangers of excessive eating and obesity. Even more so that you have the discipline to maintain such rigorous control over an extended period of time. And, something ultimately good came out of your struggle — you have helped so many people! Raizel likes to make sweet things, but, truthfully, I end up trying to give a lot of them away unless I can freeze them. Lovely little treats! Raizel is growing up to be quite the cook! She is beginning to take a real interest! A big challenge is that she likes to do the glamorous cooking, but not the scut work like cutting, and cleaning. I hope this is normal? Hard to say! I think the cutting and chopping is quite therapeutic for not having to think, lol! This is why you are a real cook! I do not find “the 3 C’s” — cutting, chopping, and cleaning therapeutic. I only wish I did. But, one can’t cook (the 4th C.??) without them. Hmmm…. Maybe I should work on my attitude to the 3 C’s and her attitude will change too??? Now, there is a thought! Thank you! I used to see something like this in the Italian neighbourhood where I worked. They were only available around Easter in a similar shape that you describe with either candied fruit or candied almonds. It is the closest I’ve seen to what I remember of the taiglach that I grew up with. I think that sprinkles could look really nice too! It is really a very flexible and adaptable recipe. It is amazing how universal so many recipes are. Dear Beautiful People, this is a much more sophisticated version of my recipe posted by Carol of https://cookingforthetimechallenged.wordpress.com, an amazing person and a wonderful cook. Enjoy! What special touch? The one with special touches is your Raizel! Any time I can make a child happy, it makes me happy, and if it’s a special child, it makes me especially happy! Thank you for mentioning my recipe and linking to it. Would you mind if I reblog yours?Yours is so much more interesting! Raizel’s comment is truly touching! I think I’ve mentioned somewhere that my grandmother used to say a Brocho HaTov v’u’Meitiv on every dish she was cooking. I only do it for Shabbos and Yom Tov dishes, but I really believe that it imbues them with a special “Tam” – taste. Taigelach do not necessarily have to be cooked with honey; we used to make them at any time during the year to throw into soups and salads. Every Brocho attracts some Ruach haKodesh – that’s the secret ingredient! Yes! When she said that, I was awestruck. Normally, teenager that she is, Raizel finds me a bit silly. It just goes to show that children are listening and watching what we do and how we live, even when we think they are not. Two weeks ago, the day before I was due to travel, I had to ring my eldest (now married) daughter in England and tell her that, because I still need more treatment on my injured leg that I would have to delay returning to Europe until the end of next month. She has always been the most passionate, quick to make sharp comments and regret later of my children. She said ‘it’s alright mummy. All shall be well’. I hesitated before saying laughingly ‘steady on – you sound like me’. ‘That’s just it’ she said ‘I’ve been learning all this time and now I need to let you know that I have learned your lessons well’. Cue tearful mummy being mopped up by daughter who then said that she would report to her three sisters to make sure they got the message clearly that they must support old mamma this time around. Of course, I will never let go of my role as mummy but my goodness me I realised that all this time they have been listening. The good passes through, unfiltered to sit in our young and grow gracefully and enhance the miracles that they already are. What a wonderful and touching story! How nice! As Yaffa says, “take a bow, take a bow!” How is your leg now? It IS improving I think (and so does my physical therapist which is probably less wishful). I am going to stay here and have therapy to the very end of November. In the great scheme of things I feel very selfish actually – I can walk albeit duck-fashion and in my brace I can even run but I want to have the best chance of being fluidly mobile going forwards. When I look outside my selfish little box I am quite ashamed of myself. But then if I am mobile I can do the things I want to do which might make a tiny difference to someone. And my husband won’t have to live with a rampant caged animal any more!! I am so happy you are getting better! I don’t think it’s selfish at all. Taking care of yourself is critical. You can’t give to others from an empty cup. I have a nice picture with that quote but I don’t know how to upload it into the comments section.